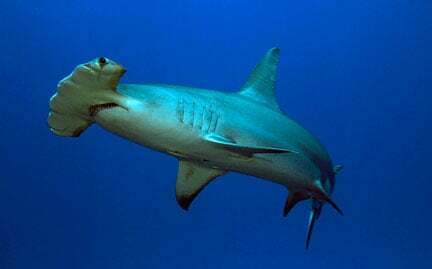 Hammerheads use their unique head as a weapon when hunting to pin down their prey. In addition to specialized eyes, hammerheads have unique sensors across their heads to help with scanning for food. Classified as a fish, hammerheads give birth to live young, unlike other fish that lay eggs. Sharks do not have bones; instead, their bodies are supported by cartilage.